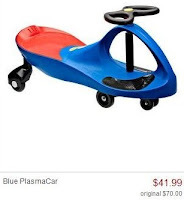 Get a PlasmaCar + More for as low as $25! Regularly $70! Here's a great deal you can get if you purchase the Zulily deal on Plum District! (Click here for detailed info on the deal) In short, you can buy a $50 Zulily credit code for as low as $25, which you can then use to buy a Plasmacar plus whatever else you want using your credit. New Plum District members click here to sign up and get $5 credit in your account. Get a $5 PD promo code from one of their FB pages: here, here, or here! The car costs $41.99. You can either stop here and use your voucher code to cover shipping cost, or shop for more stuff! 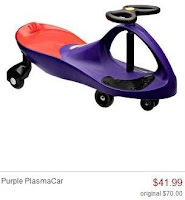 = As low as $25 for a $70 PlasmaCar + whatever else you decide to buy! PlasmaCars are extremely fun and highly rated. Visit Amazon to read some reviews and watch a great video!